Firstly, I like to thank Magnoli for their hard work and professionalism with this beautiful coat. The original that came had incorrect armhole diameters, resulting in the coat being very tight under the arms and through the back, restricting forward arm movement. Magnoli's team had me return the coat for modifications, which was great, but due to some shipping complications, they ultimately offered to create a brand new coat, and even allowed me to email additional alteration notes. Michael Kaplan made the original coat that Harrison Ford wore in Blade Runner with a 1982 press description "a russet-colored full-length cotton, with multi-pintuck collar, raglan sleeves, deep pockets, and French seams." Magnoli, I can say, got all these details right. The color is a deep, rich brown and the seams and stitching are beautiful. The interior is lined beautifully with a rust-brown satin. The material looks great and feels great. Overall, it looks like the original, although one of the modifications I requested was to increase the neck circumference, allowing for the collar to close around the jaw/mouth, as Ford is clearly seen having it when he enters the Bradbury building late in the film. I provided a still of this, and they increased it a little. I would have preferred it a bit more, but I'm not really complaining, given the aforementioned efforts on their part. Regrettably, the armholes are still wrong and rather tight around the shoulders/underarms. Hopefully, my tailor here in Los Angeles can address this. Additionally, I asked for the belt to be 76 inches, and they made it exactly 67 inches. Perhaps a clerical error? The 76 is based on the fact that I have another Deckard trench coat from a US vendor, of lower quality, but it fits perfectly and the belt length was just right. I thing they may have reversed the number, but I'll have my tailor make one. For those who think I'm picky, that's alright. I paid 515 USD, plus another $89.00- rush charge. Then I sent it back for the original return effort, costing another $115.00. Since I first ordered the coat this spring, I've begun to learn leather craft and sewing. I own many coats and trench coats and love and care very much about clothing of the highest quality, and don't mind paying a high price for such. Perhaps, one day I'll make my own Deckard trench coat. To be clear, most will find this product from Magnoli to be excellent- and it is. They were always courteous and responded quickly to emails, etc., but these minor imperfections are a letdown, somewhat. For those of you who do pay attention to materials and the quality of clothing, then hopefully this will help. I do recommend this coat, but be very, very sure about your measurements, send emails with this information, twice, if necessary. For $719.00, I got a great coat that, unfortunately, still requires additional alterations and spending. One last thought. I'm no expert on materials. Not yet, anyhow. While the cotton is very nice, there is certain stiffness to the coat that I find peculiar. I don't believe this is cotton gabardine, like Burberry is known for. I could be wrong and would happily admit it, if it were so, but the coat material is not quite what I expected. It is by no means bad. It has a nice look and texture to the touch, but for me, there is a certain weight, thickness and supple feel that it seems to lack, compared to other high end jackets and coats I own. In conclusion, buy it. 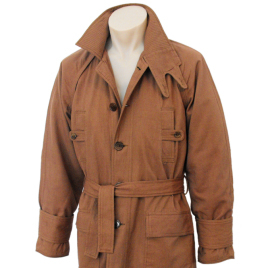 If you love this trench coat, if you love Harrison Ford's Blade Runner look, buy it. I will buy from Magnoli again, despite my listed grievances. I hope this review serves to be one of appreciation and informative.